American troops charged out of landing barges to storm the beaches of Normandy on June 6, 1944. On June 6, 2014, the United States and the other nations that made up the Allied Powers in World War II celebrated the 70th anniversary of the D-Day invasion. The Allied Powers, or Allies, included the United States, Britain, France, and the former Soviet Union. 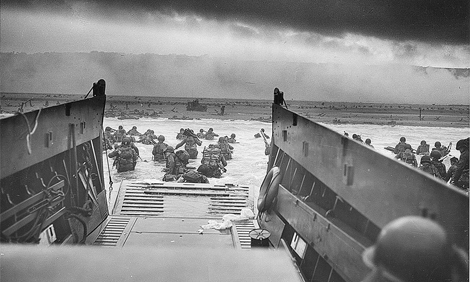 D-Day marked a major turning point in World War II. The invasion led to the Allied victory over Nazi Germany, in Europe. Ceremonies and other events were held in Europe and the United States this year to commemorate the D-Day invasion and honor the veterans who took part. More than 150,000 American, British, and Canadian troops crossed the English Channel from Britain to German-occupied France. They landed on the beaches of Normandy, where the German forces met them with heavy gunfire. More than 9,000 Allied soldiers were killed or wounded on D-Day, but the invasion was a success. The Allies broke through the German lines and began pushing the Germans back. On June 6, 2014, many D-Day anniversary events took place near the beaches where the Allied troops landed 70 years ago. World leaders, such as President Barack Obama, Queen Elizabeth II of Britain, and French President François Hollande, traveled to Normandy to honor those who fought that day. President Obama spoke about the D-Day veterans’ courageous deeds in a ceremony at the Normandy American Cemetery and Memorial. He said, “These men waged war so that we might know peace. They sacrificed so that we might be free. They fought in hopes of a day when we’d no longer need to fight. We are grateful to them.” After his speech, he shook hands with all the veterans who attended. The ceremony concluded with a 21-gun salute, a band playing “Taps,” and a military flyover. Another special ceremony took place on June 6 at the National D-Day Memorial in Bedford, Virginia. About 300 D-Day veterans gathered there that day. The ceremony began with a parachute jump by members of the U.S. Army’s Golden Knights parachute team. Many guest speakers, such as Senator Tim Kaine of Virginia, paid tribute to the D-Day veterans. Some of the veterans shared their firsthand accounts of the invasion. Even the youngest of the D-Day survivors are now in their late 80s. The 70th anniversary events may be the last large reunions of these men who helped change the course of history. When did the D-Day invasion take place? Where is the National D-Day Memorial located?